PRODUKT, THE HARD-HITTING RAPPER FROM THE BRONX WHOSE “ONE FAN AT A TIME” GRASSROOTS PHILOSOPHY HAS NETTED HIM HUNDREDS OF THOUSANDS OF VIEWS ON YOUTUBE AND DEEP RESPECT FROM THE HIP HOP BLOGOSPHERE, IS THE FIRST RAPPER TO EVER BE NOMINATED FOR MORE THAN 3 SINGLE-YEAR UNDERGROUND MUSIC AWARDS IN THE UMA’S 11 YEAR HISTORY. PRODUKT’S TWO YEAR LONG ASCENT TO NOTORIETY ACCELERATED IN 2014 WHEN HE RELEASED TWO HIT SINGLES: “HOLD IT DOWN” AND “FREAK AFFAIR.” “HOLD IT DOWN” CAUGHT THE ATTENTION OF WELL-RESPECTED MUSIC CRITICS AS WELL, AND HAS BEEN NOMINATED FOR UMA’S BEST VIDEO AND SONG OF THE YEAR HONORS. THE SUCCESS IS ALSO A RESULT OF PRODUKT’S “LARGER THAN LIFE” LIFESTYLE THAT’S HALF REBELLIOUS RAGE AND HALF CHARISMATIC COOL, THOUGH THINGS WEREN’T ALWAYS THAT BALANCED. BELIEVE IT OR NOT, THERE WAS ONCE A TIME WHEN PRODUKT WAS JUST ANOTHER DEALER CHASING THE FAST LIFE. BUT UNLIKE THE TYPICAL STORY OF A TALENTED ARTIST PURSUING THE WRONG PRIORITIES TO A DEAD END, HE INSTEAD HONED HIS RAPPING AND WRITING SKILLS AND TURNED HIS FOCUS SOLELY TO MUSIC UPON THE BIRTH OF HIS DAUGHTER. 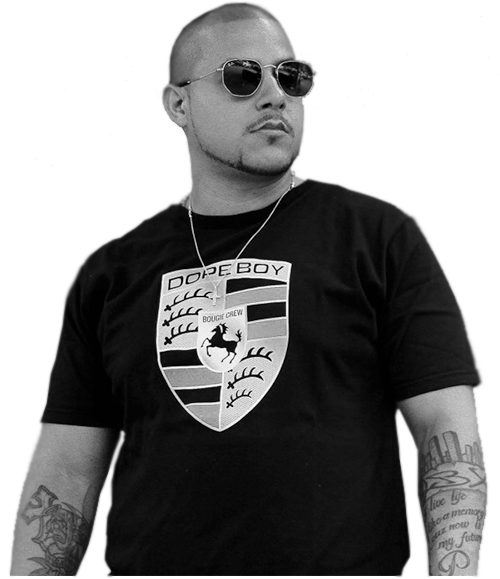 THE CONSCIOUS SHIFT IN LIFESTYLE HAS CERTAINLY PAID DIVIDENDS FOR THIS HISPANIC RAPPER WHO COUNTS BIG PUN AS HIS PRIMARY INFLUENCE. NOT ONLY HAVE TOP HIP HOP CRITICS BEEN GIVING QUOTES LIKE “ONE LISTEN TO HIS MUSIC AND IT’S PLAIN TO SEE THAT HE IS A FORCE TO BE RECKONED WITH” (YORAPS) AND “RAP RENEGADE PRODUKT IS THE EMBODIMENT OF TRUE HIP HOP” (HIP HOP LEAD), BUT HE’S ALSO BEEN MISTAKEN FOR A MAJOR LABEL ACT DUE TO THE SUPERIOR QUALITY OF HIS MUSIC VIDEOS.